Looks like vomit, tastes like heaven. Will has some remarkable comments about how unappealing this stuff looks. If it looks terrible and tastes fantastic I’d also suspect that it’s massively unhealthy. Not true, it’s chock full of good stuff for you like mangos, apples, carrots and ginger. When I read the article and recipe I was hooked. The first couple times I followed the recipe as closely. I was overwhelmed with ingredients and the process. Due to it’s demanding labor it was relegated to special occasion meals. Once my food processor broke and I had a nearly hysterical crying fit trying to prepare it for guests. Will has blocked out the memory of coming to my rescue by mincing a mountain of produce. It was still worth it. It never looks smooth, just turns into a grainy kinda nasty looking smoothy. Set aside, ready for the next part. Melt 3T butter on medium-high heat. Season generously with salt and pepper. Stir occasionally until the meat has browned (although I’m sometimes not so patient) and much of the moisture has evaporated. Add the smoothy stuff. Stir. It should be quite thick at this point. Add 1c chicken broth (low-sodium suggested). Cook on low for about hour (or as long as I can stand it). I start with it covered to get it to a soft blurpy heat (I suppose it might be simmering if it weren’t so grainy and stuff) and then uncover so it can reduce and thicken some more. I make rice in my microwave rice cooker. If you read the real recipe you’ll notice I completely dropped the frying of the breaded pork cutlets. Total overkill. I also stopped trying to fry ground pork and prepare and blend stuff at the same time. Because it still takes time I now double the recipe for the goop part. It reheats like a dream. I imagine I could freeze it, but we always eat leftovers too quickly to bother with freezing. 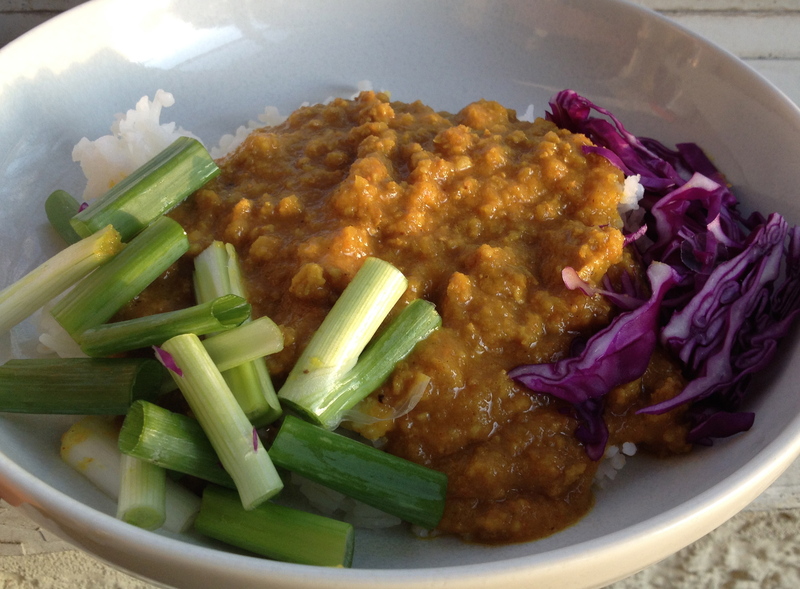 This entry was posted in Kym Cooked and tagged culinary adventures, curry, healthy food, multicultural food, NYTimes, pork. Bookmark the permalink. 1 Response to Curry Goop For All!